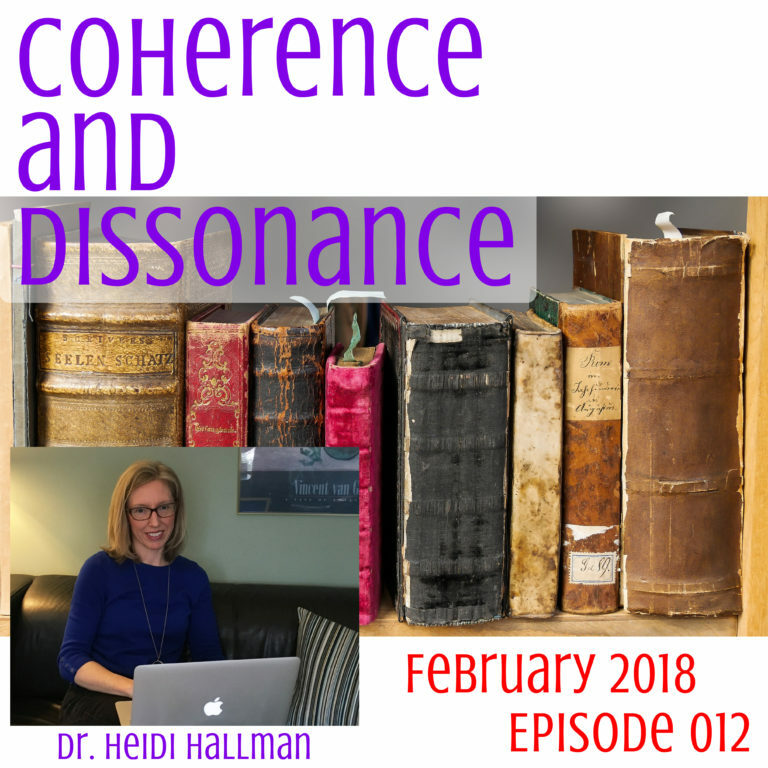 Dr. Heidi Hallman joined us on episode 012 Coherence & Dissonance to discuss how teacher preparation in English has changed in recent decades. Ralph: So for our first segment we’re excited to have Dr. Heidi Hallman joining us and she comes with quite a reputation here in the education community. You are an associate professor of English education at KU. You’ve published a number of papers. You’ve authored several books including Millennial Teachers: Learning to Teach in Uncertain Times, which was published in this last year. You’ve got a number of degrees, all of which come from the University of Wisconsin Madison, so clearly you have some connection and some roots up north of us quite a ways, and we’re excited because you were actually the author of the book and the article that we’re going to be discussing in this first segment. We read the article, “How English Language Arts Teachers are Prepared for Twenty First Century Classrooms, Results of a National Study,” but then you also published a book on the same subject recently, is that right? Hallman: Yes, that’s correct, and thank you both Michael and Laurence for hosting me on the show today. This work really started about five or six years ago, so I feel like I’ve been saturated with thinking about how English teaching has changed over the past, you know number of years, so I’m excited to talk to you today. Ralph: What exactly did you look at as far as data collected or methods? How did you go about trying to answer that question? Hallman: Well this study was done by five English teacher educators and researchers and we were at five different institutions and we always thought about this book that came out in the mid 1990s called, How English Teachers Get Taught by Peter Smagorinsky and Melissa Whiting and that is really the last book that talked about how English teachers are prepared in the United States and Dr. Smagorinsky often jokes that twenty years ago everything was collected vs snail mail. He asked people to send him their syllabus for their class and he had like ninety six syllabi come in and that was the data collection. Ralph: A lot of the programs identified standards and standard alignment and working with expectations as being a high priority, but that wasn’t necessarily, that didn’t actually match the way I would have expected it to with their their actual methods, like the actual things that they reported doing. Was I seeing that correctly? Hallman: I think standards, and this may be a difference in English teaching versus other fields, I know, you know, in science education there’s the next generation science standards that seem to have a coherent vision for the field. English teacher ed doesn’t really have that coherence. You might have people who are, we can think of as very traditional, and want to teach the canon, want to teach you know the great books and want to still adhere to that, and then we have other people who are really polar opposite in terms of what kind of literature they want to teach in their classroom, and I think our field has been hesitant to create kind of a unifying vision, and I think in reference to standards that becomes difficult because standards do create some kind of vision, and there is hesitancy I think to adopt that vision in English teaching. Our research would suggest that teacher educators should help pre-service teachers who are going to enter the field not only understand how to use standards and be adherent to them in their teaching, but also do that critique and historical work of looking at where did standards come from, why are they good, why are they not so good, and help beginning teachers understand that there is maybe not a right answer. I think that teacher educators are often afraid if they give their students standards that the students will uncritically just say, “OK this is the way we teach English and I’m just going to map these on to my lessons and this is the right way.” and I think as a field we understand that it’s one way but it might not be the only way. Woodruff: The disconnect between awareness and application is something that comes up a couple times in this paper. Toward the end there was a paragraph that was a little confusing for me, so if you will, I’d like to read that paragraph and ask if you could expand on it for my my benefit. “As prospective teachers experience the disjunction between what we see as awareness of issues and application to classrooms they may risk essentialize the student groups based on factors such as race, ethnicity, and socioeconomic status. Though not the intention of teacher educators, awareness can become a proxy for understanding.” So if you could for my benefit, talk about what essentializing student groups means, and talk more about that proxy awareness for understanding. Woodruff: So as I hear what you’re saying and I’m synthesizing with what I know, I’m going to rephrase it just so that I can see if this is how I’m reading it. To me, I mean, I don’t think I found the word differentiation in this paper anywhere, but as I’m reading it, it sounds like if we do not help preservice teachers bridge that gap between application and awareness, then we are creating difficulties for their ability to differentiate the complexities of a diverse classroom. Hallman: Yes, I think that’s exactly right. I think we have to actually have beginning teachers not just read about these things, read about, that’s what we call awareness. Kind of like, “Oh, I understand it because I’m aware of all these things.” but if they can’t enact things like a differentiating curriculum, working with different kinds of student groups, we don’t really know if they’re going to be effective in the classroom, so teaching is really not just sit at your desk and do your own thing and theorize, and I think that that part of it too is that higher ed is comfortable doing that. We in teacher ed, in an applied field, have another job to do, not just theorize and produce research but actually help the beginning teachers see what that looks like when they go into their teaching position. Woodruff: What you were saying, teachers have got to get in to it. We’ve got to solve these problems. We’ve got to be active. One of the kind of recurring themes of this podcast is responsive teaching, which means you’ve got to go out into your classroom, figure out where your kids are and what they’re doing and then respond to that, and so if you go in with a set plan of, “Hey this is what I planned and this is what we’re going to do,” you miss out an opportunity to respond to those kids, and that is so difficult to do, I can imagine it is a challenging thing to try to instill in any teacher education program. Hallman: You really hit on this myth of what teaching is. We get a lot of people who apply to be in our programs who write essays about endorsing this myth of standing in front of students, being the one in control, giving lessons and they still want that teacher as authority. Well they are encountering that teaching really isn’t that. Woodruff: This in fact, a lot of this resonated with me. There was a paragraph I found. It was early on. You kind of set some stage about philosophical necessities for this survey, this research, in the first place. There was this one paragraph that I absolutely love because it resonated with me and my science teacher education experience. The paragraph, “We maintain that recent scholarship supports the importance of subject specific methods,” and I am going to say that that is consistent in my experience. My master’s degree is in the Master of Art of Teaching in Secondary Science Education. It was very focused on science education and most of my classes were basically content pedagogy. “Especially in relation to constructivist and social constructivist theories of learning and theories that apply to both learning to teach and the learning of teacher candidates pupils. Teachers must understand their subject matter both as disciplinary adepts, and as their students experience it. That is two divergent views on that content and so that was richly part of my program as I was learning to be a science teacher and then we go down to find that specific methods courses for English, though they’ve expanded since twenty years ago, they’re still a minority part of the teacher education programs. Woodruff: So that’s a difference between my experience with the science focus program and and an ELA program and so I thought that that just filled me with joy as I read, that this is philosophically aligned how I saw my teacher education program. Hallman: I think that really speaks to, within any discipline, we want both our pre-service teachers and our students in the K-12 classroom to be almost apprentices. Learning the discipline, being aware of what are the models and formulas that guide our thinking in this discipline. Too often now, there is this generalist approach that assumes we can just be outside of a discipline. We can have these general models but that doesn’t really work when you’re an apprentice view and you have to learn the nuances of a subject area. We would love it if we had a majority English teacher ed courses, but with all of the new foci, with technology, with English language learners, with standards, sometimes there is a tendency in teacher ed now to include all of that through creating all these separate modules or courses. Then it becomes like we’re trying to cover a terrain that is way too big and that we can’t possibly really immerse ourselves and becoming experts. Ralph: It sounds like a lot of this is hinging on if if we’re going to take this apprenticeship view of teacher preparation, that the field experiences are really really important. There’s something that needs to be reinforced and in some cases expanded, but as I look at some of the data that you collected, especially in some of the alternative certification programs, there are twenty five percent of the responding alternative certification programs have zero field experience before student teaching. I know that Kansas just announced a new alternative teacher certification program. The news came out just a few days ago. The State Board of Education approving this pilot program for accelerated teaching licenses and so you can get somebody who’s teaching, and in their own classroom by themselves in just a semester, I think it was. Ralph: Yeah. it sounds. As though they’re not going to have this. They are not going to have this apprenticeship situation. Did you see any patterns in the national programs? Can you comment on that? On the fly? Hallman: I think that trend is one that is very common, and it really speaks to the location and the professionalization of teaching in the U.S. Society. We found that as we looked at how the U.S. considers teaching it’s always been a fairly lowly profession, with a lot of controversy over the routes and the perceived role of what does it mean to be a teacher. Does it mean to be a caregiver? Does it mean to have a body of expertise? I think there has been debates, even before teacher ed was included in the four year institutions. Teaching was considered something that often women did, and went through a two year normal school to receive their education. There’s a history that has framed what teaching is and I think that still influences the reason why these pilots can happen today. There’s also the demand by the consumers. There is oftentimes people who say, “Oh, I want to be a teacher and they’ve had a career and they hope that their cache of life experience and work experience can translate into an easier route into teaching. I think just that alone suggests that teaching is not really considered the same kind of profession with the body of knowledge that we know as educators is needed but is really hard to convince those outside of education that it’s needed. We really continue to fight in an uphill battle in teacher ed to maintain a focus on a curriculum and field experiences that promote that Apprentice view, because these programs, these initiatives keep happening, where the route to teaching becomes smaller and smaller. There are programs like Teach for America, for example, which you know recruit out of Ivy League schools and take people and they do their two year stint as mostly a resume builder, and it’s really those things that are considered legitimate but that really continue to deprofessionalize teaching. Ralph: And really bring about some alarmingly high turnover rates which then ultimately leads us right back into the teacher shortage that they were intended to resolve in the first place. It looks like the majority of the data that was collected during the course of this broad reaching survey was self reported. Is that a fair statement? Hallman: I would say that that is self reported. We tried to, I’d guess you call it, triangulate the data by having the survey, the syllabi collection, and then the focus groups. We also felt like the self report was an important feature of hearing from English teacher educators themselves. Hallman: I think it’s always the issue in studying teaching and the practice of teaching to think about what is thought to have been done and then what really happens. One possible follow up for the study could be actually going more into the classrooms and looking at what are pre-service teachers doing and how are their struggles manifested in the schools. Do these reports from English teacher educators really mirror the challenges that the pre-service teachers and beginning teachers are are having? Ralph: I know there are several spots throughout the course of the report where there were a number of programs reported, Yes we do this, and it is across the program, so there is no one single place. This is just a thing that happens, integrated, and that can mean a lot of different things to a lot of different people. Do you have thoughts of recommendations, perhaps, to folks who are looking to do some of this follow up research? How do we measure the efficacy of these programs? Hallman: Yeah. I think that’s a good question. We are working actually on a paper still from this data, that we call commitments to change. We actually try to create a commitment measure so it would include the philosophy of the faculty members, the mission of that program, and then what kind of time and resource is actually put into that. If your program has a commitment to preparing beginning teachers to work with the English language learners, do you have a real commitment in terms of time, resources? Do you have a a course on that? Do you have a mission that includes that? Do you place beginning teachers in schools and field placements that actually emphasize working with English language learners? We’re trying to see if there is a actual equation that can predict this commitment measure. I think all programs cannot be committed to everything. You might have one program that really emphasizes technology integration in the classroom. That has to be highlighted because as we know, we can’t really have a program that does all things, and does all things well. I think it would be important for all teacher education programs to look at what are they committed to and how do they really manifest that commitment in their program. Woodruff: One thing what I appreciated was hearing about this current research that you are working on, is that one of the things that we’ve appreciated in the past, is that like it, in papers, whether they be education or science, when we find new ways to measure something. We just think that’s elegant, and the fact that you are trying to create a way to measure a program’s priorities with this commitment mechanism, I think is exciting and I look forward to reading that just because new ways to measure stuff is cool. So that sounds really interesting to me. Hallman: I will send that to you. That’s not quite finished yet. I think one thing with English teacher ed is that we use so many anecdotes and our data collection is very focused on interviewing that for our study to have any kind of quantitative aspect was really different. We appreciated just the very basic stat that we used in the paper that you read, but we hope to use something that can create that elegant formula for looking at commitment. That’s something very different in our field. Ralph: This resonates for me because I’m basically sitting in a professional development event that helps me do my job better because I am a teacher prep person and even though I’m not ELA, there is a lot of overlap and you give me a lot to think about. Many of our listeners are classroom K-12 teachers. They are likely thinking to themselves, I don’t have control over my own teacher prep program or what my incoming young colleagues will have. For a practiceing ELA teacher in a classroom, in a department right now, what can they do to try to address some of the gaps where the training may have been in the past, or to be more ready for what folks are going to have as they are hired into their departments. What should classroom teachers do to be responsive to what’s happening in ELA teacher prep programs right now. Hallman: Well, first of all, I want to say that classroom teachers who mentor beginning teachers, who host pre-service teachers, are an essential piece of the teacher education mission. We think highly of them and thank them for all of their work that they do with beginning teachers. I see them as the ones who are often the most adept at creating this nuance between theory and practice. They are the ones who can see how things that beginning teachers learn in their teacher ed programs translate to the field. Often they’re the mentors beginning teachers look to in how to navigate those tensions. They’re on the ground. They understand what context they’re in. To be those mentors who can carefully guide beginning teachers to understand there’s maybe not one answer, but it could look like this, or it could look like that, I think that’s what we would value. That’s what I guess I would say is to keep doing that. To not be afraid to highlight those tensions for beginning teachers, because beginning teachers want to see teaching as a profession. They don’t want to go in and see it just as a script that’s given to them. Often are teachers who go into districts where there is no an emphasis on their professional decision making end up really dismayed that they don’t have more power in the classroom. For practicing ELA teachers to highlight what is the agency they have in their own classroom. That’s really important. Ralph: If we are interested in learning more, we read some of the peer reviewed literature, but you have a book out now. Secondary English Teacher Education in the United States. If there are listeners out there thinking I want to know more about this, what kind of additional information can they find in the full book? Hallman: They can find an expanded chapter on each of what I call the post 1995 themes, or the new areas of focus. There’s one on teaching literacy. There’s one on technology, one on standards, one on changing field experiences, and so they can really go more in depth with that. The final chapter also is alluding to this idea of commitments to change and how we as a field can be committed to our priorities that we have while also working alongside some of the external mandates, like Common Core standards and. edTPA, which is a final teaching portfolio. Some of those external mandates have really been what has caused the field to shift, but we want to really be sure that we’re also driving the shifts ourselves and not just at hearing to external mandates. I think we discuss that more in depth in the book.